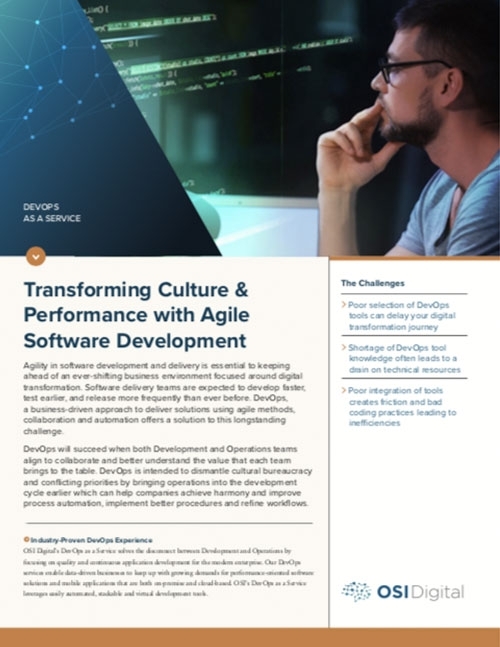 Agility in software development and delivery is essential to keeping ahead of an ever-shifting business environment focused around digital transformation. Software delivery teams are expected to develop faster, test earlier, and release more frequently than ever before. DevOps, a business-driven approach to deliver solutions using agile methods, collaboration and automation offers a solution to this longstanding challenge. DevOps will succeed when both Development and Operations teams align to collaborate and better understand the value that each team brings to the table. DevOps is intended to dismantle cultural bureaucracy and conflicting priorities by bringing operations into the development cycle earlier which can help companies achieve harmony and improve process automation, implement better procedures and re ne work flows. OSI Digital’s DevOps as a Service solves the disconnect between Development and Operations by focusing on quality and continuous application development for the modern enterprise.